Hi guys, I’m Ben Pelto and I am interning with Skytruth this summer. 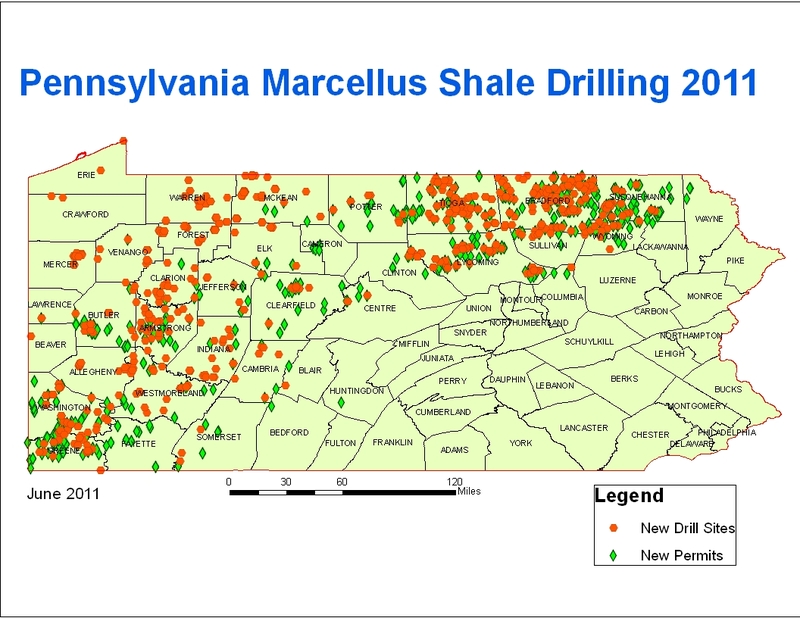 I am working on our surface water impacts of Marcellus Shale drilling project. 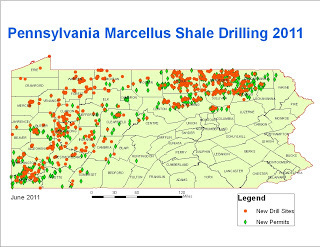 Below is a map of Pennsylvania with all of the permits and spuds (where drilling has started) for 2011 only. That is one heck of a lot of action by the drilling industry in only five months. There is no chance for the DEP, EPA, SRBC or grassroots organizations to keep pace with this level of activity. The DEP had their budget slashed this year and so will clearly not be able to meet this threat to the waters of PA before it is too late. Our mission is to start a monitoring project of surface water and perpetuate it. We want to be able to track the impacts of drilling on the streams of Pennsylvania. 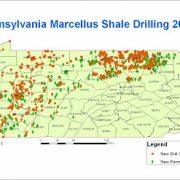 Our project on Marcellus Shale drilling is focused on surface water impacts. The plan is to go in the field to some new sites and sample for conductivity and turbidity. These two parameters will indicate to what extent drilling has effected the stream health. Turbidity is a measure of the cloudiness of the water, and these new drill sites are built on stripped land. If the proper steps are not taken then the sediment from the sites can make its way into the streams and choke them with sediment. This is detrimental to aquatic health and fish populations. Conductivity is a measure of the ions dissolved in water. High levels could be attained in local streams should produced water seep into or be dumped into streams. The clearing of sites with improper buffer zones could also lead to much sediment and ions contained in the soil being washed into adjacent streams. Our goal is to sample some new locations and determine if any are being negatively affected by fracking procedures. Oil Slick Near Venice, Louisiana – Operator Identified? Oil Slick Near Venice, Louisiana – Who Owns the Well?